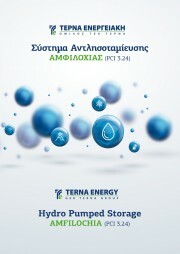 The project “Hydro-pumped storage in Greece – Amfilochia”promoted by TERNA ENERGY S.A. has been selected as Project of Common Interest under the code name PCI 3.24.This project supports the implementation of the North- South electricity interconnections in Central Eastern and South Eastern Europe (NSI East Electricitypriority corridor of EU Regulation). 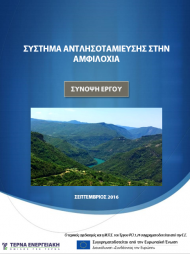 Moreover, the Project has been classified as a Strategic Investment by the Greek Authorities and has been incorporated in the related procedures under the Law 3894/2010. The purpose of the Project is energy storing to assist renewable sources integration. The excess wind, photovoltaic or thermal energy will be hydraulically stored, through water pumping from the lower to the upper reservoirs, during the low load consumption or in renewable overproduction periods. Subsequently, energy will be recovered via turbine mode, during the peak load hours. Two separate upper reservoirs, “Agios Georgios” and “Pyrgos”. Reservoirs’ total effective storage capacity. Turbines’ total net annual electricity generation.